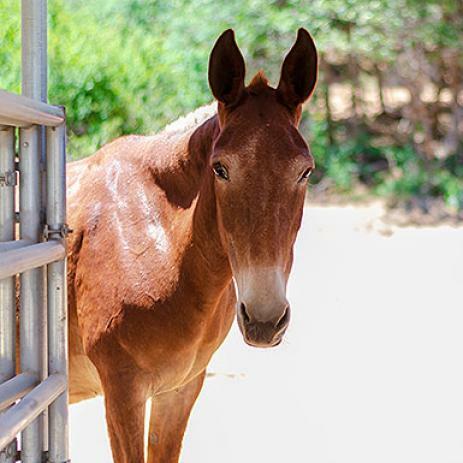 Lucky is a lovely older molly (female mule) who was born in approximately 1991. She came to us with her full brother, Fiero. They are one year apart in age, and practically twins. She was somewhat standoffish when we got her but has learned very quickly that we are trustworthy and has become quite friendly and easy to catch, even in a large pasture. She loves to be scratched and really appreciates any kind of horse treat; she's not picky. 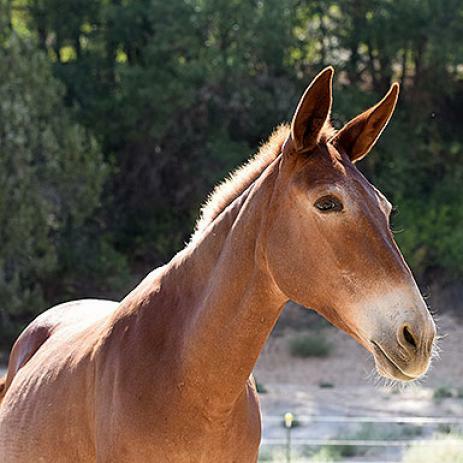 She is past the age of being ridden, but is a lovely companion, and would ideally like to be adopted with her brother. She is very healthy but needs a strict diet of grass hay to keep some metabolic tendencies in check. Neither she nor Fiero can be around dogs or other small animals, but they have great social skills with other equines.